Ten years ago, we decided that it was time to bring popcorn back to Boothbay Harbor. After all, it had been years since anyone sold popcorn in Boothbay Harbor, and what could be more fun than making and selling delicious, eye-popping flavors of popcorn? After several months in the kitchen, learning how to create a great tasting popcorn and developing our business plan, we were ready to take the plunge! We opened our doors on June 7, 2008 and were absolutely astounded at the excitement that followed. Our single biggest impression after that first day was the extraordinary reaction that we saw when handing out sample after sample of our crazy flavors! That reaction continues to amaze us every day and fuels our passion to spread our delicious popcorn far and wide. In 2015, we opened our second location in Freeport Maine, across from L.L. Bean. We happily acknowledge that our popcorn is labor-intensive. All of our popcorn is made by hand, one batch at a time, and hand-sifted to ensure that our customers don’t end up with broken pieces and unpopped kernels. We focus on quality throughout the entire process. When our customers buy Coastal Maine Popcorn, they are buying a product made with the highest quality, honesty and integrity. We never compromise by using cheap products or processes, and we work diligently to source only the best ingredients. We use tapioca syrup, instead of high fructose corn syrup, in our sweet flavors. Some of our savory flavors include olive oil, pink Himalayan sea salt, all-natural rosemary and garlic oils, and cheeses sourced from a Kentucky dairy farm. Our popcorn is the foundation for all of our fun and lively flavors, so it is always made with the best non-GMO corn we can find. All of our flavors are gluten free, except for S’mores and Wasabi Soy. We air pop our popcorn, rather than using oil, which makes it healthier, crunchier, and provides a longer shelf life than oil popped varieties. 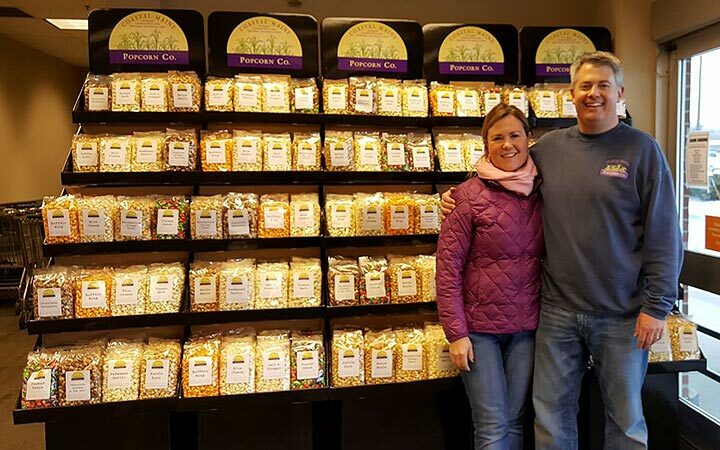 Coastal Maine Popcorn is focused on expanding its reach throughout the United States, through our Retail Stores, our Wholesale Program and through our unique role in providing personalized popcorn for Fundraising, Special Events and Corporate Gifting Programs. Contact us to learn more about being part of a successful partnership. Coastal Maine Popcorn Co., Inc.
wholesale business has been popping out of control and requires our full attention. We are sorry for any inconvenience.